Campbell's® Condensed Cream of Mushroom Soup combines with onion, zucchini, chilies and low-fat Cheddar cheese to make a perfect casserole. 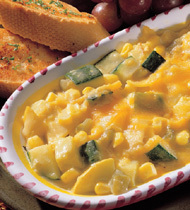 With less than 100 calories per serving, this heart healthy side dish compliments any menu. garlic, peeled, minced	 1 tbsp. zucchini, cubed	 2 1/2 qt. 1. In large skillet or rondo, heat oil over medium-high heat; add onion and sauté 6 minutes. Add garlic and continue cooking 2 minutes. 2. Add zucchini and continue cooking, stirring often, until tender, about 7-8 minutes. green chiles, drained, chopped	 2 qt. 3. Stir in chiles and corn and heat through. CCP: Heat to an internal temperature of 165°F. or higher for 15 seconds. corn tortilla, 6-inch, cut into thin strips	 20 ea. low fat Cheddar cheese, shredded	 1 lb. 1 qt. 4. Pour vegetable mixture into bottom of full-size hotel pan (12x20x2-inch) and spread into an even layer. Spread tortilla strips evenly over top of vegetable layer. Sprinkle with 3 cups cheese. 5. 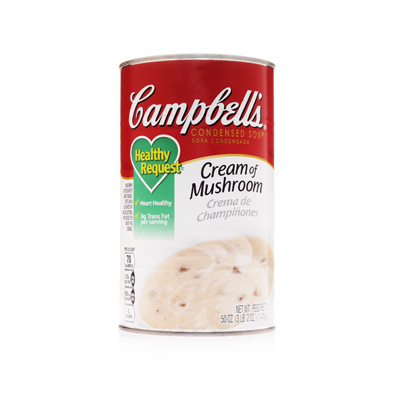 Spread top evenly with can of Mushroom Soup and sprinkle top with remaining cheese. 6. Bake in 325°F. conventional or 275°F. convection oven for 35-40 minutes. CCP: Cook to an internal temperature of 165°F. or higher for 15 seconds. 7. To Serve: Portion into 1/2 cup (#8 scoop) servings. low fat Cheddar cheese	 1 lb. 1 qt.